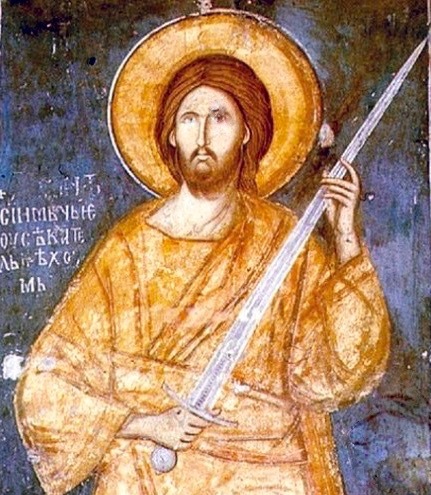 Icon of Jesus with sword, 14th century, Katholikon of the Sacred Monastery of the Ascension of Christ, Kosovo. Photograph by Thanasis Christodoulou – Own work, CC BY-SA 4.0, Wikimedia Commons. Who would you be if you ever became fully yourself? (Adapted from Chittister, Between the Dark and the Daylight, 123) What new possibilities might arise? How would your relationships change? What fears would disappear? How do you imagine your life would be different? I’m not talking about a selfish attitude toward others and the world. I am talking about living into our better and truer selves, being real and authentic, experiencing wholeness and integrity within ourselves; and then taking all of that, all that we are and all that we have, and offering it to our relationships, to the world, to Christ. Who would you be if you ever became fully yourself? I think that’s the question that lies beneath today’s gospel (Matthew 10:24-39) and I think it points to something we all long for and struggle with. Do you remember what it was like growing up: the questions, the struggles, the fears, the hopes, the dreams, the failures and doubts, the relationships? I remember it as clearly as if it was yesterday. Do you know why? Because it was yesterday and it is today. Growing up isn’t about only kids. It’s a life long process and growing up at any age, at every age, is just hard work. I think that’s what Jesus is getting at in today’s gospel. We often hear the gospel as a prescribed set of beliefs, teachings, and behaviors, but what if there is more to the gospel, more to life, and more to you and me than that? What if the gospel is a path toward becoming more fully ourselves and Jesus is a symbol of what that fullness looks like? The sword Jesus brings is the sword of separation. It is neither a rejection of family and relationships nor is it destructive of life. Rather, Jesus’ sword of separation is generative of life and relationships. It unbinds, frees, and brings about the separateness necessary for growing up and finding life. “Those who find their life will lose it,” Jesus says, “and those who lose their life for my sake” – those who separate from their old life and ways – “will find it” (Matthew 10:39). Separation is necessary for the creation of life and for that life to grow; whether it is physical, emotional, or spiritual. It is at the heart of our growing up and becoming more fully ourselves. Let me give you a few examples of what I am talking about. As told in Genesis 1, the act of creation is also an act of separation. In the beginning God separates the light from the darkness and later, the day from the night. Biologists tell us that reproduction and growth are processes of cells dividing and separating. The day you were born you separated from your mother’s womb, a first and necessary step in becoming more fully yourself. How old were you when you realized that at least some of your parents’ ideas, beliefs, and ways were not your own? That was about your separation and growing up. Do you remember what adolescence was like? Yours? Your child’s? The struggles and conflicts, the restlessness, and the changes were a form of separation and another step in growing up. Moving out of your parents’ home to begin work or to go to school is a separation by which you sought to become more fully yourself. The question “Will you marry me?” is an invitation to separate and begin a new life. The significant transitions in our lives – birth, marriage, divorce, a new job, retirement, and even death – are about the separation that takes us to a new life, even when painful or unwanted. Matthew got up and left his tax booth in order to follow Jesus (Matthew 9:9). James and John separated from their father, their boat, and nets to become followers of Jesus (Matthew 4:21-22; Mark 1:19).Two disciples left John the Baptist and followed Jesus (John 1:35-37). They all chose a path of becoming more fully themselves. That’s what discipleship is about. Jesus himself chose separation. When he was twelve years old he separated himself from Mary and Joseph to stay behind and remain in his Father’s house. At the end of that story Luke comments, “And Jesus increased in wisdom and years, and in divine and human favor” (Luke 2:52). Separateness is the freedom to think our own thoughts, hear our own voices, discern our own concerns, establish our own values, and chart our own life’s path. As Christians we have chosen to do that in relationship with Christ. It means discovering for ourselves our “lacks and limitations,” our strengths and gifts, our hopes and dreams, our questions and our answers. Separateness, says Sr. Joan Chittister, a Catholic nun, is “the willingness to live inside ourselves rather than to live off the thoughts and words and chaos and clamor around us” and it “heightens our very awareness of being alive (Chittister, 122). Separation opens us to the “quiet call of the Godness within us” and it is a “moment of maturation” (Chittister, 123). So let me ask you again. Who would you be if you ever became fully yourself, if you lived into God’s dream for you and your life? From whom or what do you need to separate, not as a rejection of them but as a reclaiming of yourself? Is it a particular person, a voice or experience from the past, a fear? What do you need to let go of, to separate from, in order to grow up and come alive? For most of us at some level this is about parental and authority figures, those, as Jesus points out in today’s gospel, who are closest to us, “members of one’s own household” (Matthew 10:36). But it could also be about institutions, a political party, our country, even the Church. Jesus is not asking us to abandon our relationships but to reorient our lives, to become more fully ourselves, and to find our life and identity in him. And that raises a question for me. Might the sword of separation need to be applied to our relationship with God and Jesus? If separation is the beginning of growth and the basis of new life then the answer has to be yes. Yes, separation from God and Jesus is necessary to our spiritual life and growth. Again, this is not about rejection but about creating the freedom and space to allow a new understanding, a new relationship, a new God-image to arise within us. Chances are you’ve already experienced aspects of this separation. Is your understanding of who God or Jesus is today the same as it was last year, five years ago, fifteen, twenty-five? Do you read and understand the Bible today the same way you did when you were a child? Do you still pray the same way you did a few years ago or when you were a child? Probably not. You’ve grown and changed. You separated from previous beliefs, understandings, and practices to claim new ones that reflect who you are today. And if your answer is, “Yes, it is the same today as it was back then,” then maybe there’s a problem. Why has it not changed? What’s stunting your growth? From what do you need to separate? What about you and me? What will we say? What separation do you need today to take a next step into becoming more fully yourself? Again, I’m late. Finally have time to read your sermons thoughtfully and reflect on them. As to being fully ourselves: this would seem to be a practice and a skill that all young people should be taught to develop. In today’s cyber world so many young people allow the thoughts of others to dictate how they think of themselves. So many are bullied so badly, they see suicide as the only way out. So, so sad. Such a waste of life. I can’t remember my school years being a hell of bullying. Maybe I wasn’t paying attention. Maybe the Holy Spirit gave me the strength to ignore the negative comments of others. Maybe I was just too self-centered to care what others thought of me. Perhaps we should work to cultivate more of that self-centering in our youth. Encourage them and support them in learning to ignore the demeaning, hateful comments of others.